Use this spacer to remove the trim assembly from the Kawasaki X2. You can also use this to move the steering back 1 inch on any Kawasaki hull with a 140 pump. Made from billet 6061 and anodized for corrosion resistance. This bearing assembly is a direct repalcement for the OEM assembly. Fits nearly all Kawasaki models. Made from all anodized aluminum and high temp silicone rubber. 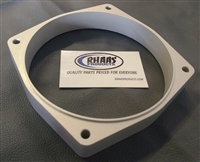 Stainless Bearing and high quality seals are included and pre-installed. Ready to run.